Protect Your Garden: Eco-Friendly Solutions for Healthy Plants by Ed Rosenthal is a great book for young gardeners and young-in-experience gardeners, but it’s also one more experienced gardeners will occasionally take into the garden, too. It’s very well organized, helped tremendously for those looking for a quick answer to a specific problem by the color-coded page edges. Want to look up those clustered bronzy seed-like eggs on the underside of the squash leaves? Brick-edged Pests pages are your section. Want to know why your perfectly watered tomato leaves are curling up as though trying to retain moisture? The green-edged Diseases and Nutrients section may point you to copper deficiency. Caramel pages contain the environmental stresses section while the burgundy pages offer time-tested methods of control. The bibliography spans six pages followed by several pages of what Rosenthal dubs ‘sources,’ which are actually full-page ads. (Gotta admire the commercial enterprise involved). I like this book for several reasons: The pictures are terrific close-ups and a helpful size for easier identification of pests, diseases, whatever while holding the book right next to the problem. They also offer at least two stages of a pest’s life, so you can not only definitively identify that thing that’s crawling out of the cuke or squash stalk, you can go to the Exclusion and Prevention list on the same page to see if there’s something you could do NOW, like trap them with the color yellow, or allspice, clove or bay oil, Neem oil, Pyrethrum or Spinosad, and what beneficial(s) you could bring to bear — assassin bugs, those fascinating fire-engine red dune buggies-like insects, tachinid flies, and/or parasitoid wasps for example. Some of the pests and pictures are not really necessary – the gopher strikes me as superfluous, but whatever. 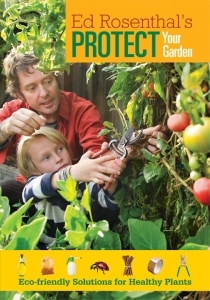 I appreciate the focus on the ecological approach, and like the front cover of a dad teaching his son in a hands-on way to prune what might be a blight-ravaged leaf off a tomato plant. Get kids in the garden as early as possible is my motto. My kids bellowed mightily for years about it, but one now gardens assiduously, and the other eats organically and cooks his own food, so I must have done something right. Ed Rosenthal’s Protect You Garden: Eco-Friendly Solutions for Healthy Plants (Quick American Publishing, 2013, $24.95).